Cartridge Manufacturer, C. Sharps & Co.
Full Company Name: C. Sharps & Co. In the late 1850s the United States Ordnance Department began testing many different weapons systems with the goal of modernizing its aging technology. 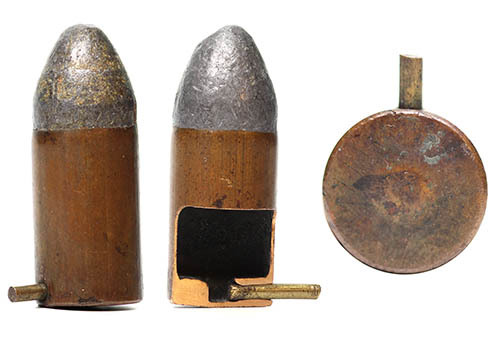 They had received many favorable reports of European armies adopting the pinfire system so in 1857 and 1858 a few tests were performed on various calibers of pinfire revolvers, all of which received very favorable reviews. September 28, 1861 marked the entrance of pinfire arms in the American Civil War. On this date 52 Lefaucheux revolvers with ammunition were purchased from a New York gun dealer, Hermann Boker & Co. A month later the Army’s purchasing agent, Colonel George Lee Schuyler, purchased 10,000 Lefaucheux Model 1854 revolvers directly from Eugene Lefaucheux’s company in France. Another 2281 revolvers were acquired through small purchases from various military suppliers. 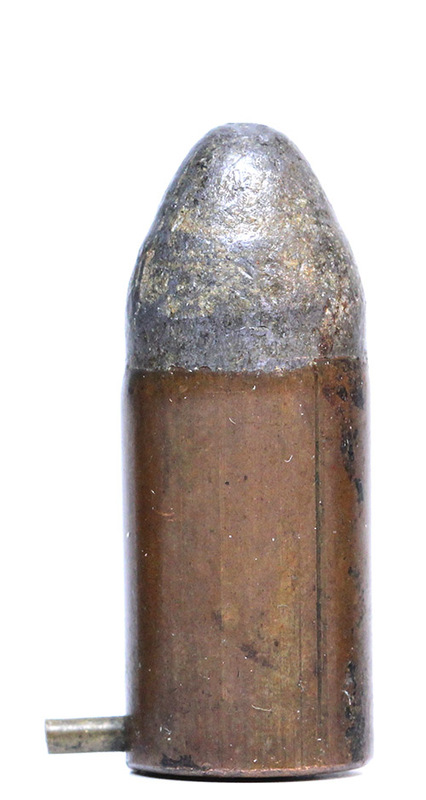 Colonel Schuyler also brought back at least 200,000 pinfire cartridges. After using these cartridges they noticed that sometimes the thin copper case on the cartridges would blow out on the base when detonating. This would sometimes cause issues with the revolvers cycling. The soldier would then have an extra step of removing that cartridge before the gun was once again usable. Other than this the revolver got pretty favorable reviews. But the Arsenal strove for perfection so at the beginning of January 1862 Lieutenant Treadwell of the Frankford Arsenal met with Christian Sharps of Philadelphia, Pennsylvania to talk about fixing this blowout problem and manufacturing pinfire cartridges to a more powerful specification. C. Sharps & Company made an agreement with the Frankford Arsenal to supply 50,000 cartridges by the first of February, 200,000 by end of February and 400,000 per month after until they reached 1,000,000 cartridges delivered. Sharps came up with the idea to make the base thicker and the case slightly longer so it would hold more powder. It was actually a pretty great idea but Sharps had a problem of over-engineering things. His design can be seen in US patent 34,987 and in the sectioned cartridge pictured. He made the copper case thicker at the bottom with a hole through it for the pin and a spot for the primer. Since this was all built as part of the case it was complicated to produce. 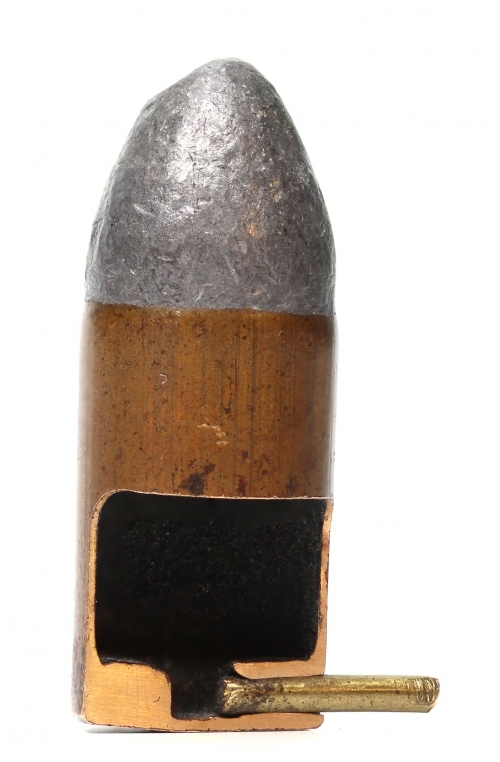 By February 20th Lieutenant Treadwell had still not received cartridges from Sharps so the arsenal received permission to procure cartridges from a second source. The first correspondence from Sharps finally arrives on March 20th in a letter to Major Laidley, the new commander of the Frankford Arsenal. Sharps said that they were having a hard time perfecting the process of making the cartridges and that they also needed to move to a new location because Philadelphia laws did not allow them to have more than 25 pounds of powder on their premises. 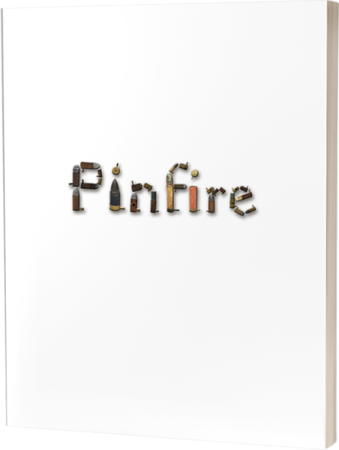 This news causes Major Laidley to seek out a third vendor to provide pinfire cartridges. On April 4th Christian Sharps finally delivers some test samples. However, Major Laidley was disgusted with the samples and denied them with a pretty strong letter back to Sharps, calling them a “failure” and of “no value to the United States.” On May 10th Sharps tries again but Major Laidley again rejects the second group of test samples from the newly formed Sharps & Hankins because their cartridges were unsatisfactory; they use poor quality powder; and had way too many failures. Finally on June 7th Christian Sharps delivers 46,000 cartridges that were accepted. This is all that ended up being accepted by them; not even 5% of the original requested amount. Here are three of Christian Sharps’ pinfire cartridges dropped by Union soldiers in June of 1863 at the Battle of Liberty Gap in Bell Buckle, TN during the Tullahoma Campaign.